The Jungle Ball Zone is a unique experience for any child. An interactive jungle with knock down palm trees, ball pond plus a lost city feel that gets their imaginations working in top gear. 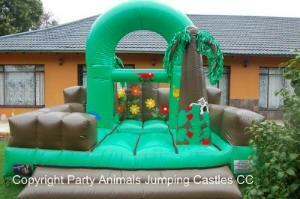 The animals and plants are painted and sewn onto the castle to create a jungle feeling. The ball pit in the center can be filled with “coloured fun balls”. These can be rented separately, and there is +-200 balls per bag. The motor is a .75kw motor with a 15m extension lead. If your power point is further than 15m from where the castle will be placed, you will need to provide an additional extension lead. These are not supplied by Party Animals.